When it was announced that Wes Anderson would be adapting Roald Dahl’s short story Fantastic Mr. Fox, it came as something of a surprise. Up to that point, Anderson had only made films based on original material that he created himself or with a co-collaborator. With The Darjeeling Limited (2007), many felt that the auteur had reached a creative cul de sac. Not only would he be adapting someone one else’s work, but he would be doing it via old school stop-motion animation – virtually unheard of in this day and age what with the proliferation of computer animation. This change of direction seems to have paid off for Anderson who has delivered his most satisfying film since The Royal Tenenbaums (2001). Mr. Fox (Clooney) used to steal birds, but has reformed his ways and is now a newspaper man. He is getting old and tired of living in a foxhole. So, he consults with his real estate agent Stan Weasel (Wes Anderson). Before he takes the plunge, Mr. Fox talks with his lawyer Clive Badger, Esq. (Murray) and ends up buying a treehouse so that he and his family can live in comfort. However, cousin Kristofferson (Eric Anderson) comes to visit and makes Ash (Schwartzman), Mr. Fox’s son, jealous with his athletic prowess. Meanwhile, in her spare time, Mrs. Fox (Streep) paints portraits of thunderstorms. Mr. Fox decides to pull one more job stealing birds to eat, but this one is his most ambitious gig to date. With the help of his landlord Kylie (Wolodarsky), he plans to steal chickens from farmer Boggis, then the next night geese from farmer Bunce, and finally the following night he steals some of farmer Bean’s cider from his secret cellar. Understandably upset, the three farmers get together and plan to kill Mr. Fox. As a result, he and his family are on the run and hunted. They have to call in the favors of all their friends if they hope to evade the farmers’ wrath. Anderson still has an uncanny knack for picking just the right song for a given scene. Early on, Mr. and Mrs. Fox playfully yet stealthily circumvent a farmer to steal one of his birds all scored to the melodic strains of “Heroes and Villains” by the Beach Boys. Later on, Anderson pulls out the obligatory Rolling Stones cue and scores a sequence to “Street Fighting Man.” There is something thrilling about seeing these vintage tracks pop up in an animated film – a genre that tends to rely on mainly orchestral music or more contemporary songs. The stop-motion animation actually gives the film a personal, handcrafted feel that had been absent from Anderson’s work and harkens back to his first couple of efforts, which are the ones where most people first noticed and fell in love with his films. The animation is incredibly rendered and executed, reminiscent of the vintage Rankin and Bass cartoons that kids of Anderson’s generation (and beyond) grew up on. There is a tangible quality to the characters and their environment that is still missing from most computer animation. As the Fantastic Mr. Fox (2009) progresses, it becomes apparent what drew Anderson to this project. Thematically, it fits right in with his other films. Mr. Fox is a charismatic yet rebellious patriarch, much like Royal in The Royal Tenenbaums and Steve Zissou in The Life Aquatic with Steve Zissou (2004). Furthermore, the Fox family is a highly intelligent dysfunctional one much like the family in Tenenbaums. The casting is spot on with George Clooney and Meryl Streep playing Mr. and Mrs. Fox. They banter back and forth like a couple from an old screwball comedy. Anderson has not forgotten what the majority of animated films not made by Pixar seem to have – that the best of the genre appeal to both kids and adults. 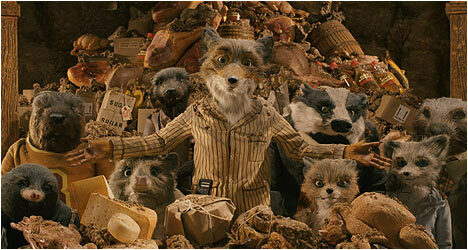 Fantastic Mr. Fox does not talk down to kids and also still manages to appeal to the Anderson faithful. This film is a delightful, entertaining adventure well worth experiencing. Fantastic Mr. Fox looks great on Blu-Ray and it appears that Criterion are using the existing one from 20th Century Fox. The colors are rich and vibrant with all kinds of detail yet still retaining a filmic look. “Introduction by Petey” features the character voiced by Jarvis Cocker providing a brief and wryly amusing primer for the film. There is an audio commentary by director Wes Anderson. He wanted to make Fantastic Mr. Fox because it was an important book from his childhood. He points out that the screenplay was written at the Dahl family house and the environment around it inspired many of the settings in the film. Anderson speaks briefly about adapting the book and also how the animation process works, including recording the voices. This is a very informative track from the engaging director. “Animatic” allows you to watch the film in storyboard form. “The Making of Fantastic Mr. Fox” is comprised of seven featurettes covering various aspects of the production. There is footage of the cast recording their voices for the film and it is interesting to see how committed they are (especially Clooney) to the roles. Also included are puppet tests and early animation that gives us a good idea of what the characters were to look and act like. There is a collection of photographs of houses and furniture for the art department to reference in the film. There is a fascinating look at various puppets being created in the studio. There is a time-lapse photography featurette documenting how scenes are painstakingly animated over days. Also included is a look at composer Alexandre Desplat working on the score. Finally, there is footage of many miniature objects used in the film. The attention to detail is incredible! “Roald Dahl Reads Fantastic Mr. Fox” is an audio recording of the man reading his own book. It is always interesting to hear the author’s voice and how they personalize their work. “Award Speeches” features Wes Anderson voicing a puppet in stop-motion animation giving thanks for an award the film received. Also included is a potential speech if the film had won an Academy Award and a press statement by Mr. Fox that is done in amusing fashion. “Set Photography by Ray Lewis” is a collection of behind the scenes stills of characters, props and so on. “Publicity Featurettes” take a look at Roald Dahl and what inspired the script. In another, Anderson talks about how they expanded the book into a feature-length film. There is a look at the puppet makers and how they created the various characters. Also included is a look at the production design and how Dahl’s home influenced it. Finally, Bill Murray talks about his character, Badger, and praises the crew’s hard work. “Sony Robots Commercial” is an animated ad that Wes Anderson created. “Discussion and Analysis” features two kids talking at length about what they thought of Fantastic Mr. Fox. “Fantastic Mr. Dahl” is an excellent hour-long documentary on the man that acts as an ideal primer on his life and work. “The Witch’s Tree” features vintage footage of Dahl and one of his favorite trees – the one that inspired Fantastic Mr. Fox. Finally, there is “Dahl’s Manuscripts”: a selection of pages from his first 1968 manuscript of the book along with sketches he created to go with the text.